The Heavy Metal exhibit, currently on display at the University of New Brunswick’s Art Centre and featuring UNB’s ArtZone, is part of an environmental awareness project in support of World Water Day, which is being recognized this Sunday, Mar. 22. The exhibit was created to help bring awareness to the issue of e-waste in our landfills, which is having a growing negative impact on the environment, specifically in our waterways. 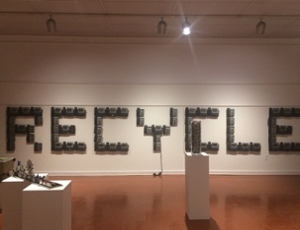 UNB ArtZone students have spent months preparing the Heavy Metal art exhibit by retrieving e-waste that would otherwise end up in the landfill and turning it into art. The exhibit, which will be open to the public until April 9, is made from discarded electronics such as televisions, batteries, computers, telephones, etc. brought by members of the local Fredericton community. After the exhibit, the waste will be recycled through a local e-cycling company, Beaverdam Recyclers. For more information about UNB’s ArtZone and the Heavy Metal exhibit, contact Marie Maltais .